Starting in 1986, Election Data Services has produced posters depicting the election results from each year's federal November general election. Now in it's 17th version over the past four decades, the 2018 poster focuses on federal offices (Congressional) results on the front side, depicting county by county contest results for US Senatorial election, and district level results for the contests for the US House of Representative. 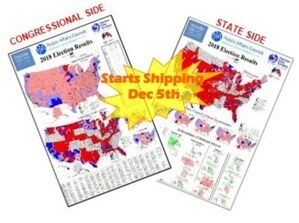 The printing of the poster was held so that the results of the later November run-off for US Senate in Mississippi could also be shown by county for the state. The front side also lists the names and party for the winners and returning members in each state for all Governor, US Senate and US House members starting in 2019, providing a convenient reference listing for your wall. A summary of the election in an "At A Glance" table shows the political composition of the US House, US Senate, Governor, Chief Election Officer, Overall State Legislature Control, as well as individual State Senate and State House compositions. In addition, the table shows the number of incumbent and open seats for each chamber's political composition, by party. The data is summarized for before the election, after the election, how many were switched to and how many were retained by each party. Continuing the practice started in 2010, both sides of the poster are utilized to provide the widest range of information. On the State side, the Governor results are shown by county for all states where the contests appeared. In addition, results of statewide outcomes are shown for Governor, Control of State Legislatures, State Senate and State House party control, and vote for highest election official in the state. County level results of 19 different referendums in 14 different states are also shown for a variety of different topics of national interest. 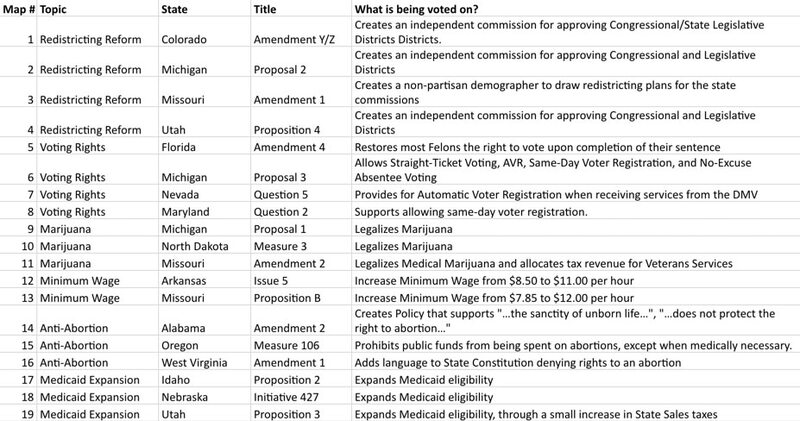 See Ballot Measures Ideas table below. Individual posters are 43” high x 30.5” wide. Posters are available either folded or flat and are suitable for hanging on your wall. If you have the wall space a special "Double Purchase" price has been created so you can see both side of the poster at once. You'll be shipped two maps for the price of 1.6 maps. *Postage and Handling added separately.